If you see any of these signs in your home, it is a good indication that your home is in need of foundation repair services. The foundation of your home may be crumbling or chipping due to excess water pooling around the foundation. If water is allowed to pool near the foundation of your home, it may seep into the porous concrete, weakening it and leading to concrete deterioration such as flaking, chipping, and crumbling. The concrete may also be crumbling due to age or improper mixing at the time it was poured. No matter what caused the concrete deterioration, it can lead to various problems, such as settlement, shifting, or cracking. You may think that the deteriorating concrete foundation on your home needs to be completely replaced. There are however, a few other repair options. Many types of foundation cracks and slab cracks can be repaired with underpinning solutions that support the foundation and restore it to its original position. Helical piers are screwed into the ground beneath the foundation to stabilize and lift a sinking foundation, closing cracks that formed due to the settlement. Steel push piers work in much the same way, but are driven into the ground instead of screwed in. Pressure grouting can also close foundation cracks and lift settling foundations. 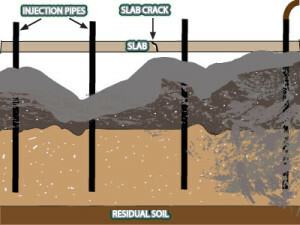 This is a method that involves injecting a cement based grout beneath the foundation to fill voids and provide support. Atlas Piers also offers concrete repair services to fix any issues you may have with your crumbling and chipping foundation. Whether your crumbling foundation was caused by excess water, age, or poor quality concrete mixing, it is important to contact an expert right away. The team at Atlas Piers can examine your foundation to find the cause and the best solution for your home. Contact us today for more information on our various foundation repair options.